Summer of 2019 Reading Program, Book Now! An Out Of This World Magic Show! Get Ready Now for the Summer of 2019 Reading Program! "A Universe Of Stories Out Of This World Magic Show"
Motivating Your Summer Children to Read Using Magic, Ventriloquism, Music, and Audience participation. Reader Rabbit makes his LIVE Magical Appearance. For Ages 2-92! 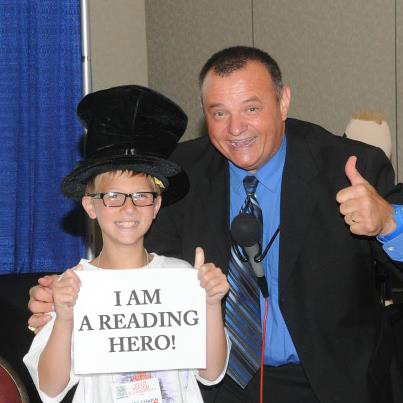 My name is John Carlson and I am a magician, ventriloquist and educational entertainer. I have been performing at Libraries for over twenty five years. In fact the first magic show I ever performed was when I was 10 years old at the Brooklyn Public Library. Since then I have traveled around the world performing at thousands of venues, but my real love is performing at Libraries and motivating kids to read. After my show, I GUARANTEE the books will fly off the shelf in your Library. Each year my show is customized for the State Library Reading Theme and every summer my calendar completely books up so please call me right away at 1-800-269-1106 and/or fill out the form below.